Article by Doug Chaltry; last updated 2 February 2008. 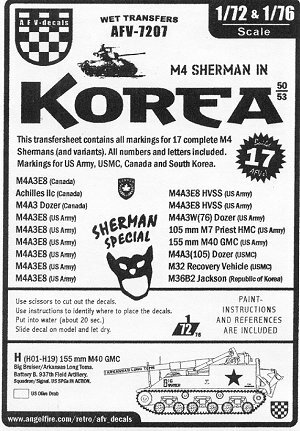 This extremely colorful set includes markings for 17 tanks (listed in the table below), primarily Shermans, although some M4 variants are included as well. The most common vehicle represented here is the M4A3E8 HVSS Sherman, which sported some very colorful artwork during Operations Ripper and Killer. Note that the markings for the ROK M36 state that it's an M36B2, which is incorrect; it should be a standard M36. Like all of the AFV-Decals, these are very well printed, very thin, and registration is perfect. Thank you to AFV-Decals (now Bison Decals) for the review sample.